Alcohol is great. Alcohol is fun. Alcohol also, quite brutally, gives you the runs. Most people have experienced the feeling of waking up after a particularly rowdy night out, head throbbing, then making a desperate break for the bathroom. And let's be honest: This ain't your average No. 2. All those drinks that seemed like such a great idea the night before suddenly want to leave your body at the speed of light, which, naturally, isn't all that pleasant. So what's up with this gut-wrenching reaction? We talked to Dr. Urvish Shah, gastroenterologist in Lansing, Michigan, to find out. Remember last night when you had to pee, like, a billion times? "Alcohol is a diuretic," explains Shah. "When you have a drink, it enters the bloodstream immediately and it also causes the pituitary gland in the brain to inhibit the production of vasopressin." Vasopressin regulates the body's water retention and constricts blood vessels. Without it, the kidneys send water straight to the bladder and you straight to the line for the bar bathroom. It's not pee you're worried about the next morning. According to gastroenterologist Dr. Kathlynn Caguiat, "Alcohol can increase gut motility and it doesn't get broken down before it reaches the colon, where bacteria feast on these, resulting in bloating and diarrhea." Those bacteria love the alcohol you feed them, and they repay you with extra gas and crap. What's more, increased gut motility means everything's moving more rapidly than usual. That in turn means the colon has less time to absorb any water, which can result in watery stool and diarrhea. "The more concentrated the alcohol, the worse the reaction will be," Shah warns, which explains the severe reactions whiskey can provoke the next morning. Liquors will produce the worst booze craps, in other words. But beer won't exactly be your friend either. This is because the body produces enzymes to assist in breaking down the complex carbohydrates found in your favorite suds as they travel to the small intestine. When you're slinging high-carb options like beer down your gullet fairly quickly -- and ethanol is speeding up the digestive process, remember -- some of the carbs will make it to your large intestine without breaking down. The bacteria in the large intestine start fermenting those carbs, resulting in gas, cramping, loose stool, and diarrhea. Pay attention to what you're drinking! If beer seems to be the most likely culprit, try switching to wine or clear liquor. Everyone is affected differently, so it's going to be a personal call. Shah's best advice? "If you want to stay out of the bathroom, stop drinking so much!" Fair enough, Dr. Shah. And he doesn't want you to forget to eat, either. "Alcohol increases the acid content in your stomach, which can easily irritate the lining and trigger stomach and digestive problems." 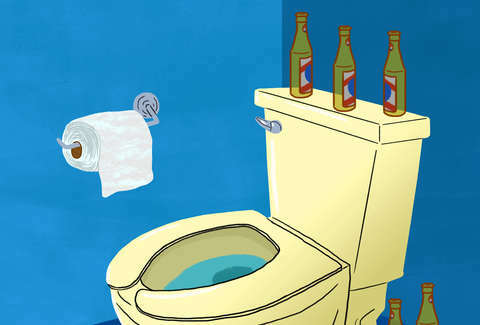 Having food in there often helps reduce alcohol's abrasive effect on the intestines. An empty stomach means more alcohol is moving to the small intestine and getting absorbed by the blood, which can affect other organs like the colon, causing loose stools and diarrhea. Food acts as a protective mechanism by slowing the process of gastric emptying. Despite what your hangover may be telling you, probably not. Although not extremely pleasant, looser stool and diarrhea after drinking isn't usually a big deal. But if you find yourself sprinting to the bathroom upwards of 10 times a day, or if your booze poops last more than 24-48 hours, see your doctor. You could have a more serious bowel issue at play. Sarah Anderson is a former Thrillist employee and current law student. She can't wait to share these findings on her next big night out. Follow her @smileforsarah and @sarah_jfa.